Savvy Spending: JCP: $10 off $25 or $20 off $50 purchase coupons! Now through 8/6! 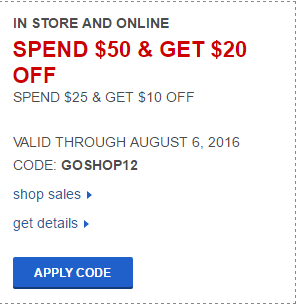 JCP: $10 off $25 or $20 off $50 purchase coupons! Now through 8/6! Need some back to school clothes? Now through August 6th, JCP has a few coupons for you! Save $10 off $25 or $20 off $50 purchase! You can print the coupons or use them online with code GOSHOP12 at checkout. Be sure to check your mailbox also- I received a $10 off $10 coupon in the mail!